Panerabread.com, the Web site for the American chain of bakery-cafe fast casual restaurants by the same name, leaked millions of customer records — including names, email and physical addresses, birthdays and the last four digits of the customer’s credit card number — for at least eight months before it was yanked offline earlier today, KrebsOnSecurity has learned. The data available in plain text from Panera’s site appeared to include records for any customer who has signed up for an account to order food online via panerabread.com. The St. Louis-based company, which has more than 2,100 retail locations in the United States and Canada, allows customers to order food online for pickup in stores or for delivery. Redacted records from Panera’s site, which let anyone search by a variety of customer attributes, including phone number, email address, physical address or loyalty account number. In this example, the phone number was a main line at an office building where many different employees apparently registered to order food online. KrebsOnSecurity learned about the breach earlier today after being contacted by security researcher Dylan Houlihan, who said he initially notified Panera about customer data leaking from its Web site back on August 2, 2017. A long message thread that Houlihan shared between himself and Panera indicates that Mike Gustavison, Panera’s director of information security, initially dismissed Houlihan’s report as a likely scam. A week later, however, those messages suggest that the company had validated Houlihan’s findings and was working on a fix. “Thank you for the information we are working on a resolution,” Gustavison wrote. 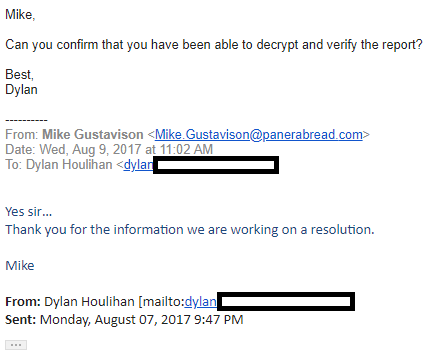 Panera was alerted about the data leakage in early August 2017, and said it was fixing the problem then.